4160 June Springs Road 6.55 Acres. 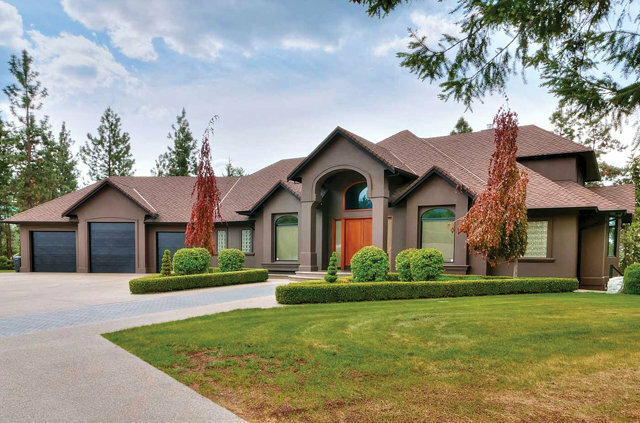 Private Estate Property South East Kelowna surrounded in prestigious estate sized properties. Offers nearly level land, luxury main house, attached 3 car garage, detached double garage and 2400 square foot detached garage/workshop. 2nd caretaker's home on the property. The Main home house provides over 5200 square feet living. Open concept main floor that includes vaulted great room, granite island kitchen, breakfast nook and formal dining room. . Tall standing cedars surround the pool, adjacent to the pool is a wet bar complete with island. Enjoy relaxing by the outdoor free standing rock fireplace Main floor master bedroom with private spa inspired bath. 4 bedrooms, 4 full bathrooms. Lower level features a media room and wine cellar that is traditionally finished in Cedar. A car lovers dream in the 3-car attached garage complete with hoist. Secondary home on property offers 3 plus den and 2 baths. Detached workshop features engine hoist, fully heated and higher ceilings.